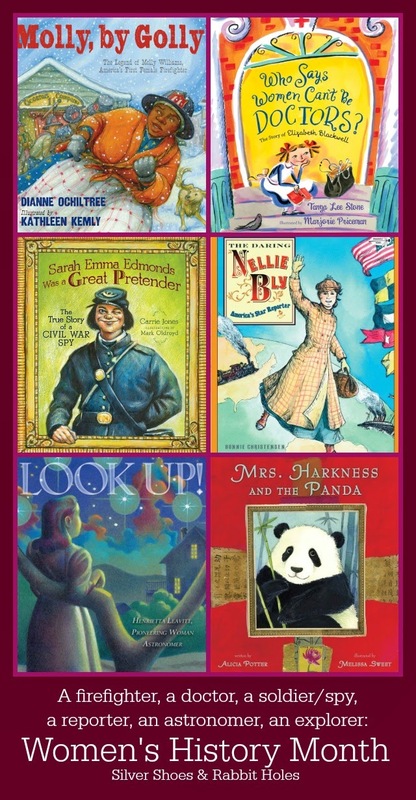 Another set of books for Women's History Month! Molly, by Golly! 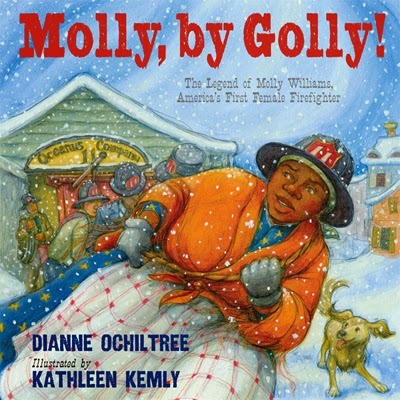 The Legend of Molly Williams, America's First Female Firefighter by Dianna Ochiltree, illustrated by Kathleen Kemly. Calkins Creek, 2012. Molly Williams was a slave woman, the cook for a member of the local volunteer fire department. One night, when a bad case of influenza prevented many of the fire department volunteers from responding to a fire, Molly pitched in, becoming a valuable member of the department. Legend has it that she wore her usual work clothes - a blue calico dress and checked apron - when she fought fires. Not much is known about her, but it's nice to see a picture book attempt to tell her story anyway. The book trailer for Molly, by Golly! Who Says Women Can't Be Doctors? 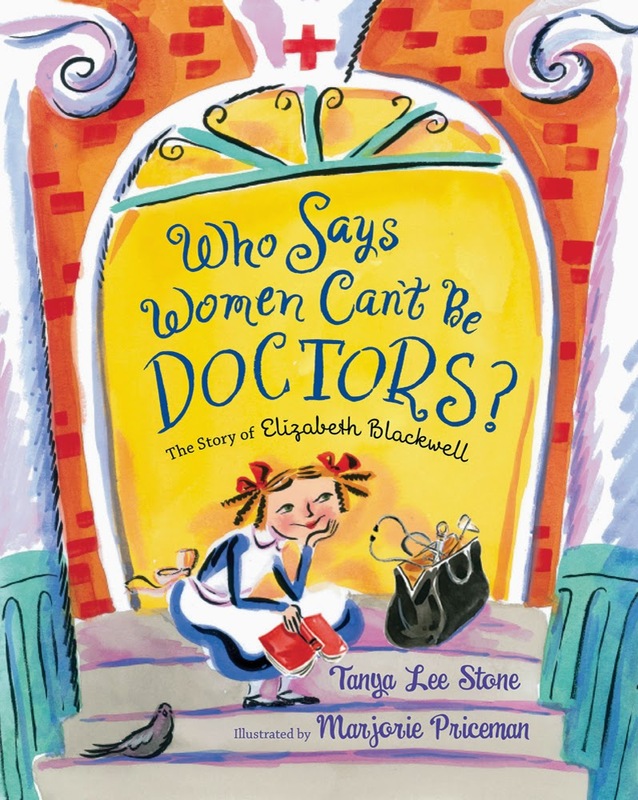 The Story of Elizabeth Blackwell by Tanya Lee Stone, illustrated by Marjorie Priceman. Henry Holt / Christy Ottaviano Books, 2013. Elizabeth Blackwell was 24 when she called upon a very sick friend. The friend confessed that she would have been much more comfortable seeing a female doctor. Blackwell had always been a tough, adventurous sort, but becoming a doctor had never crossed her mind. The idea took hold of her, and she began applying to medical schools. She was finally accepted, but her admission turned out to be a joke! Elizabeth had the last laugh, graduating at the top of her class. This book tells Blackwell's story using fun language, and bright, beautiful illustrations. One of our favorites this year! A short biography of Elizabeth Blackwell. 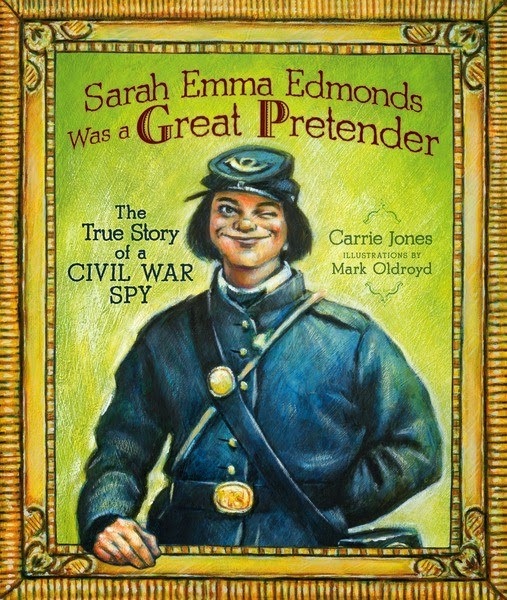 Sarah Emma Edmonds Was a Great Pretender: The True Story of a Civil War Spy by Carrie Jones, illustrated by Mark Oldroyd. Carolrhoda Books, 2011. Sarah Emma Edmonds was born in Canada. Her abusive father wished he had a son, so Sarah pretended to be a boy. She eventually ran away to the United States, pretending to be a man, in order to make a living. When the Civil War broke out, Sarah wanted to help, so she pretended to be a nurse - a male nurse - named Frank Thompson. Frank Thompson went on to become a spy. Sarah even pretended to be Frank Thompson pretending to be a woman, whatever it took to get the enemy plans back to the Union army. Her charade didn't cease until she became ill, and had to check into the hospital as a woman. "Frank Thompson" was labeled a deserter, ending her career as a male spy. Very interesting book. A book trailer by the Fork Shoals Library. 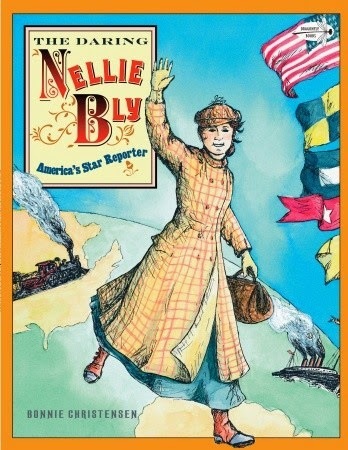 The Daring Nellie Bly: America's Star Reporter by Bonnie Christenson. Alfred A. Knopf, 2003. Nellie Bly was the pen name of Elizabeth Cochran, a famous stunt reporter during the heyday of yellow journalism. She began her career in Pittsburgh, becoming famous for her reports while spending a year in Mexico. After returning to the U.S., the newspaper tried to assign her to their arts and theatre section. She left for New York City, where she took an assignment for Joseph Pulitzer's New York World, going undercover at a mental asylum for 10 days. Her muckraking helped spur changes at the facility. She became most famous for traveling around the world in 72 days, beating the record set by Jules Verne's fictional Phileas Fogg in Around the World in 80 Days. She later married a millionaire industrialist, taking over his company after his death. She held numerous patents for inventions, and later, returned to reporting as a war correspondent on the eastern front, during World War I. While I do not have a video for you, you can learn more about Nellie Bly at the informative website Nellie Bly Online. I definitely recommend the picture book. Look Up! 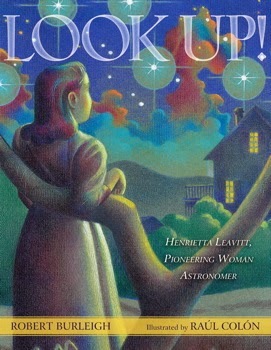 Henrietta Leavitt, Pioneering Woman Astronomer by Robert Burleigh, illustrated by Raúl Colón. Simon & Schuster / Paula Wiseman Books, 2013. Henrietta Leavitt was a graduate of Radcliffe College. While working as a "computer," examining photographic plates at Harvard College Observatory, Leavitt made an important discovery. While she received little recognition in her lifetime, it was her discovery that first allowed astronomers to measure the distance between Earth and other galaxies. The book is very simple in its approach, which makes it wonderful for the smaller set. I found it to be as informative as a short encyclopedia entry, but then again, astronomy has never been my forte. (It is more informative than my simple little summary, though!) Big Sis was excited for this one, but it's since been overshadowed by some of the other books we've read. A short documentary about Henrietta Leavitt. 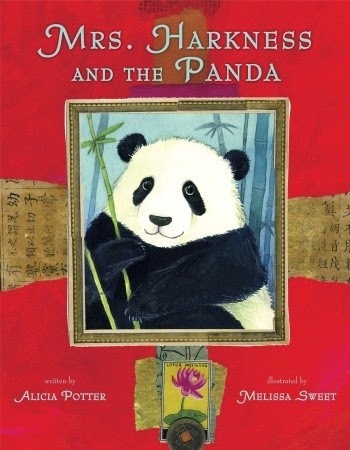 Mrs. Harkness and the Panda by Alicia Potter, illustrated by Melissa Sweet. Alfred A. Knopf, 2012. Ruth Harkness was a fashion designer and socialite. She married her husband, Bill Harkness, just before he left for China to search for a giant panda. Bill died in China, and his widow decided to finish what he had started. She set out for China, and with the help of a Chinese-American explorer, set about discovering an elusive panda herself. A baby panda was finally found in a tree, and Mrs. Harkness returned to the United States with the baby panda wrapped in her arms. The panda was presented to the Brookfield Zoo in Chicago. Mrs. Harkness returned to China for a second panda. She died a decade later, in 1947. Potter's storytelling is pretty straightforward, magically enhanced by Melissa Sweet's illustrations. (I love Melissa Sweet!) I appreciated the Author's Notes at the end, which mention that today, taking a wild baby panda from its natural habitat would be considered wrong, but in the context of her time, what Harkness did was considered admirable, and gave many zoologists and animal experts their first glimpse of a giant panda, an animal so elusive, some Chinese even believed it to be mythical. Here is an interesting BBC News story on Ruth Harkness. Of course, pandas continue to fascinate. Here is a link to the Giant Panda Cam at the Smithsonian National Zoological Park in Washington, D.C., and here is the link to the Panda Cam at the San Diego Zoo. I've been behind this month due to illness, but the girls and I have been working our way through the library bag! 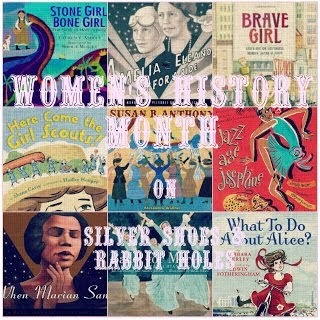 More to share for Women's History Month the rest of the week! Oooo I'm pinning this awesome list. I want to learn about the first gal firefighter. Thanks! :) I wish there was more known about Molly Williams, but the book is interesting! You get a feel for how difficult fire-fighting was in the early 1800s, too. This is a great book list. It is more important than ever to show little girls strong role models when women are often trivialized in sexed-up and meaningless roles in movies/tv shows/cartoons etc. I didn't know at all about those great ladies and it is awesome to find out that there are books to tell their story. I wish you a speedy recovery! It's amazing how you manage to read even though you are sick. When I am ill, I am completely useless! True! I want my daughters to have a great variety of role models, not just pretty people in magazines or on TV.